A pool filter keeps your water nice and clean, but it can’t remove debris that winds up on the pool floor or stuck to the walls. This is where a vacuum cleaning system comes in. There are four main options for inground pool vacuums, but most people prefer not to use manual cleaners. A manual pool vacuum is attached to a long pole that is held by the user outside of the pool and driven over the surfaces to be cleaned. It is attached to the suction side of the pool filtration pump, and is the cheapest option. However, it requires regular manual labor and puts much the same drain on your filter as a suction-side pool cleaner. Suction-side vacuums attach to the suction side of your existing pool filter pump and dump vacuumed debris into the filter. The suction causes them to move randomly around the bottom surface of the pool. They are the cheapest option aside from manual vacuums, but they create additional wear and tear on your filter and do not always do the best job. However, for pool owners who have a limited budget and no time to do the job manually, a suction-side system will often suffice in a small pool. Suction cleaners have the advantage of being easy to install. Essentially, you flood a hose, attach it to the suction side of your pool pump, and attach the flooded suction cleaner. Valve adjustments may be necessary to ensure that the flow is in the desirable range. The Baracuda G3 W03000 is well-liked by users for thoroughness and longevity. It is a medium-priced option that has individually-replaceable parts. The Hayward Aquanaut 200 is also popular with pool owners. A little more expensive than the Baracuda, it also has good longevity and cleaning power. Pressure-side vacuums attach to the pressure side of your filter pump and move around using the water pressure for force. They often require the use of a booster pump in addition to your current filtration system, which can increase water circulation but also increase your cost. Pressure-side vacuums are generally a mid-priced option, but the cost of the booster pump must be considered. They do reduce strain on your filter by not dumping debris into it. Debris picked up by this type of vacuum is stored in a self-contained bag, but they are better at picking up larger debris than small, and usually clean the floor better than the walls. When installing a pressure-side vacuum, the dedicated pressure line in the pool is usually fitted with a quick-release connector. This attaches to the vacuum line, which must be adjusted to the correct length of the pool by following the instructions provided. All that is required once the vacuum is attached to the pump is to test the wheel speed and adjust the jet on the back for optimal wall climbing. Installing the booster pump should be done by a qualified technician. 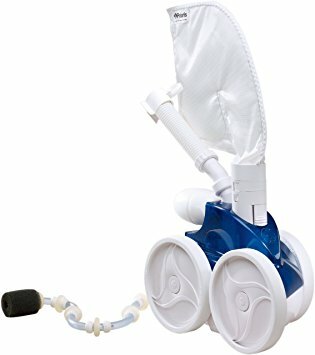 Four wheels keep the Pentair LL505G Kreepy Krauly Legend Pressure-Side Inground Pool Cleaner upright and contribute to its ability to clean stairs and walls well. It uses a booster pump that is reportedly easy to set up. The relatively-similar but slightly higher-rated Polaris Vac-Sweep 380 Pressure Side Pool Cleaner is also popular for delivering a thorough clean. It requires a booster pump as well. Robotic vacuums are the most effective, energy-efficient option. However, they are more expensive than the other options. Instead of being attached to your existing filtration system, robotic vacuums are self-contained units that are plugged into an electrical outlet. They may have fancy software that allows them to map your pool and make sure the entire surface is cleaned. Many of them can climb the walls up to the water level. Robotic cleaners are the easiest option to install. Once the cleaner caddy is hooked into a wall outlet, all you need to do is plug the cleaner into the caddy and submerge it in the pool. Then you choose the programming option on the caddy’s control panel and press start. 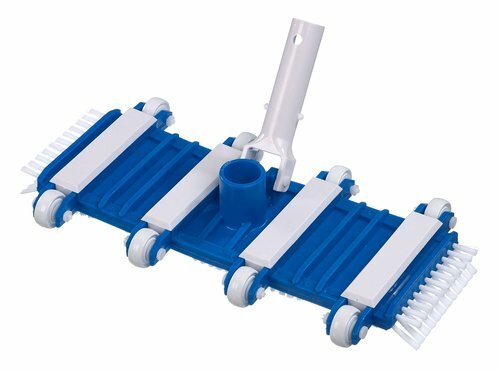 For a budget option, the Aquabot Junior ABJR Automatic Robotic Inground Pool Cleaner is popular with users. 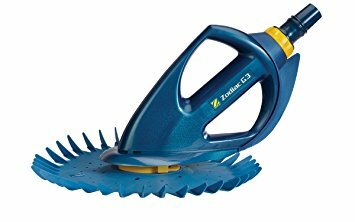 It cleans floors and lower walls with scrubbing brushes, has a long cable for even large pools, and picks up almost all debris. 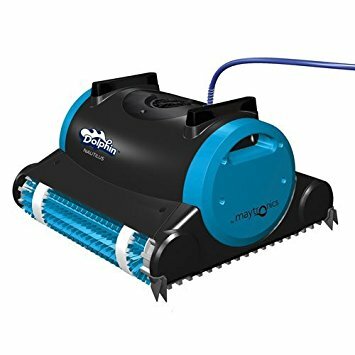 If your budget is a little larger, the Dolphin 99996356 Dolphin Triton Robotic Pool Cleaner gets high marks for thoroughness and ease of use. It cleans up to the water line and learns your pool to ensure maximally efficient cleaning.